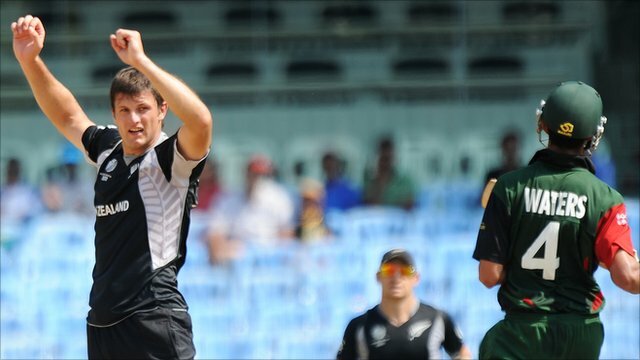 Paceman Hamish Bennett took 4-16 as New Zealand thrashed Kenya by 10 wickets in their opening World Cup group game. Tim Southee (3-13) and Jacob Oram (3-2) each claimed three wickets as the African side were bowled out for 69 in 23.5 overs after choosing to bat. New Zealand needed only eight overs to knock off the runs, with Martin Guptill scoring 39 and fellow opener Brendon McCullum adding 26 in Chennai. Kenya's total was the fifth-lowest in the history of the tournament. The minnows had no answer to some outstanding New Zealand bowling, which was full and accurate. Only 12 runs were on the board when Tim Southee trapped Alex Obanda with the final ball of the seventh over, the first of five lbws in the innings. Bennett, in only his ninth international, caused all manner of problems with his unorthodox, open-chested leaping action. He struck in his second over and in his third removed Kenya's most experience player, Steve Tikolo, with a magnificent delivery that uprooted off-stump, before pinning Collins Obuya for 14 four balls later. Maurice Ouma was dismissed in Bennett's next over, leaving him with 4-13 from four overs and Kenya at 49-5 after 16. Replays showed the ball striking the pad outside the line of off-stump but the Kenyans chose not to review the decision. Southee beat the batsmen for pace to claim wickets eight and nine from the final two balls of the 23rd over but was denied the chance of a hat-trick as Oram had last man Elijah Otieno caught at short mid-wicket. After only eight balls of the New Zealand reply Guptill had three fours to his name, and a sweetly timed shot off Otieno in the fourth over sailed over long-off for six. The first ball of the next over was launched high down the ground by Guptill and cleared the sightscreen, while three fours in an over from McCullum, the winning hit a nonchalant reverse sweep. "We never expected it to be so easy," said New Zealand skipper Daniel Vettori, who for once was wicketless in his six overs. "The wicket was a little up-and-down, but we bowled really well. "From now on, it is important that we stand up and it is important to perform in every game. Kenya captain Jimmy Kamande admitted his side had much to learn and said: "Most of our batsmen played across the line, we didn't play straight. "We were a bit nervous. But the first game is out of the way."